Developer / company: Everimaging Ltd.
HDR Darkroom is a professional program used to produce producing sophisticated looking HDR images. If an object moves through the scene while you are taking multiple shots, our Ghost Reduction technology corrects the problem of "ghosting" when the images are combined. HDR Darkroom's improved alignment algorithm corrects problems when your camera moves slightly between the bracketed frames. Nearly all of the processing controls in HDR Darkroom are real time, making HDR Darkroom the fastest-processing HDR software on the market with real-time processing as a standard feature. 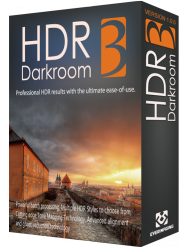 If you need more information please contact the developers of HDR Darkroom (Everimaging Ltd.), or check out their product website.